Peter Schiff says to go for the gold. 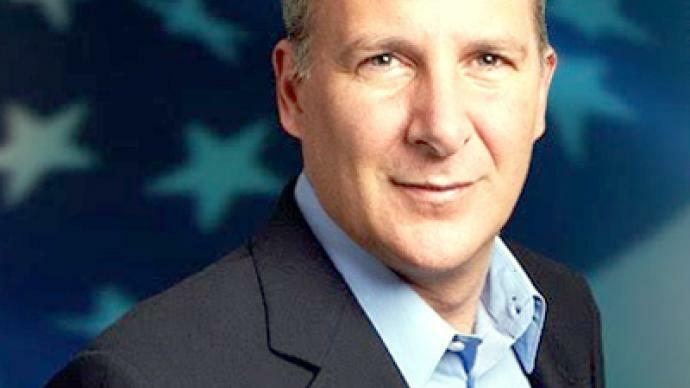 Peter Schiff says gold is more than just another precious metal. According to the president of Euro Pacific Capital, gold is a thermometer for the economy. And with gold prices at a high of $1851 an ounce, the economy isn’t getting any healthier. “Gold going up every day is saying that the economy is sick. It’s really, really sick,” Schiff told RT. Yet, he added, world leaders are ignoring the surge in gold prices as if the increase wasn’t telling them something. As central banks continue to print money while currencies devalue day by day, Schiff said owning gold is a safe haven. Some say treasuries are a safe haven, but Schiff asks, “What is it a safe haven from?” Gold, he said, is an alternative to owning currencies like the US dollar, the euro and the yen, which he said are being created too quickly and in too much quantity. “I keep hearing people on television saying people aren’t buying gold because of inflation,” saudSchiff. “Gold is a safe haven from inflation." Schiff noted that many are still skeptical of buying into gold, citing widespread fear of a bubble ready to pop. He believes, however, that prices are only going to be higher. Schiff said he was right about this before and he is right about this now. And according to Schiff, people need to realize it before it’s too late.